After finishing my FAA required 40 hour test program, I took “Eddie” home to give her a 50 hour inspection, make a few adjustments, and change out a panel instrument. One of the issues I wanted to address that cropped up during the flight testing was her unwillingness to come back to neutral once a left or right turn was initiated. I could smoothly bring her back, but I feel she should be self-stabilizing. Upon inspection after the wings were removed, it didn’t take long to see the issue. It seems that the fuel tank has taken a decided forward “bulge” along the centerline of the tank on the front tank wall and is pressing up against the Aileron Control Cross Link Rod CS12 that attaches to both CS08 cranks. While the pressure is not enough to prevent the control rod to move side to side when commanded, it is of sufficient force to prevent the aileron controls from self centering…..and enough to place a just barely noticeable bend in the Aileron Cross Link Rod. I hope that the server does not strip the three photos I have attached. Am I to be concerned that the tank will split? Can I place an expandable brace against the front wall of the cockpit module and slowly “press” the bulge back to whence it came? Or at least in far enough so as to not interfere with the Cross Link Rod? That is the ugliest tank bulge I have personally seen. But this had happened before to someone in the UK and the tank was replaced. 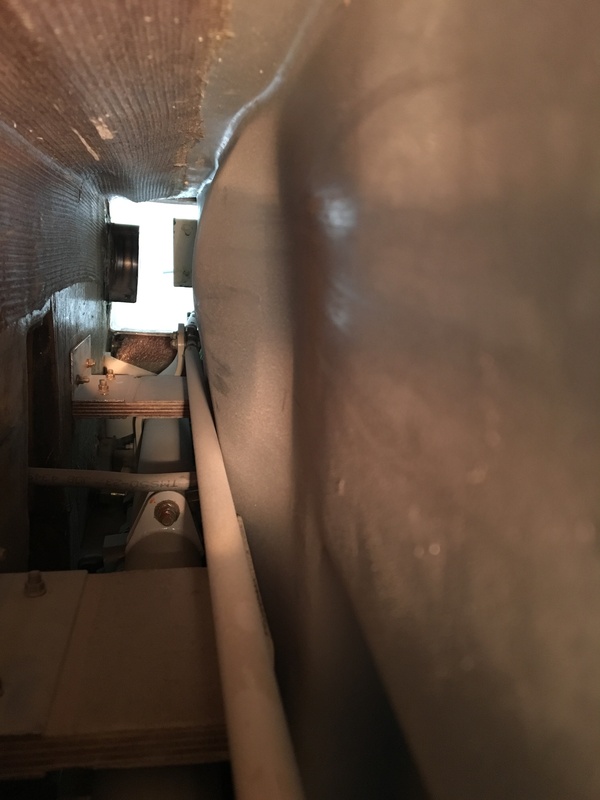 It appears that the upper support bracket on the front has sagged and I�m sure the tank has settled toward the floor or any support under the tank and it is giving you some serious problems. I would say with some confidence that the front tank thickness is not up to specifications and is thin enough to bow more than what is normal. I would order a new tank personally. You have a conduit that appears to be coming down and will eventually rest on your push rod arm, so that may need some attention. The top of the tank support will be a bummer to reinforce right now if in fact it is sagging. Take a good look at it and check it is still secure to the front and don�t ask me how I would go back in and fix that. I would jack up the tank with a 2x4 or similar and see if it moves. If it does, that will be tough to fix. You could fab up another tank brace to push the bulge back.� I would probably make it adjustable myself to slowly push the bulge back. I think I would empty the tank, pull the fuel bosses out and insert 1 inch 90 degree heater hose for draining and plug them� I would then warm the tank up with a hot water filling, hoping to not crack it, then rapidly empty it and start putting in a board with braces and wedges to push it back to clear plus a � inch and see if it stays after it cools. Of course for you in Las Vegas in mid summer that might be 2AM in the morning. If it pushes in a bit, then spend the time expanding the existing forward tank supports using the same concept as the original cockpit build manual. In your case, consider remaking your tank braces wider (all the way from the outboard position where they are more toward and even with the center tunnel) and installed as before to clear the spars. The flat braces against the tank must hold the tank back and be really stiff but not very thick to prevent the tank from bulging into the controls. Tempered aluminum angle (6061 T-6 comes to mind rather than 20 series hardware store aluminum. You don�t have much space to work with, but a larger aluminum stock may be necessary. The tank bulge is gross enough I would say you are a candidate for further problems. New tanks have that diagonal molding to prevent that sort of thing. The excessive heat in your area of the world is a curse and a blessing. The hot fuel and a thin tank wall probably caused this, but may allow you to do a fairly quick band aid fix. After finishing my FAA required 40 hour test program, I took �Eddie� home to give her a 50 hour inspection, make a few adjustments, and change out a panel instrument. One of the issues I wanted to address that cropped up during the flight testing was her unwillingness to come back to neutral once a left or right turn was initiated. I could smoothly bring her back, but I feel she should be self-stabilizing. Upon inspection after the wings were removed, it didn�t take long to see the issue. 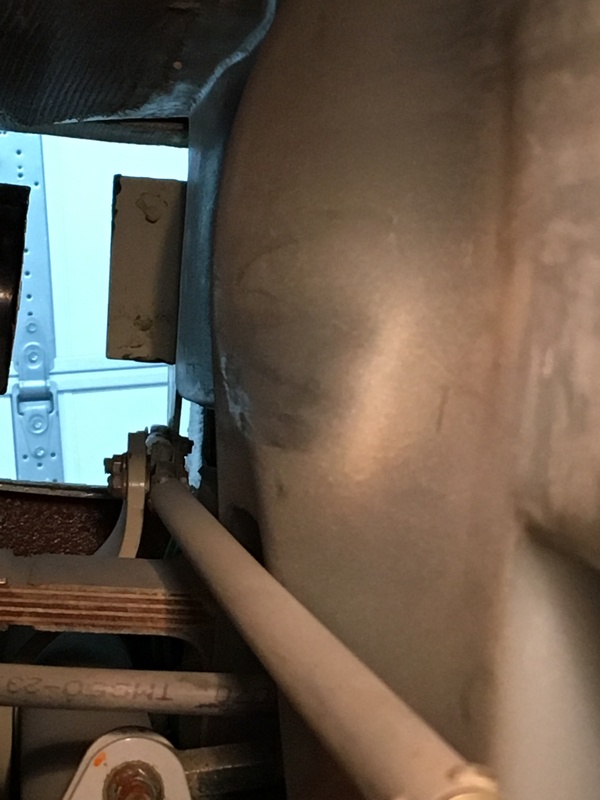 It seems that the fuel tank has taken a decided forward �bulge� along the centerline of the tank on the front tank wall and is pressing up against the Aileron Control Cross Link Rod CS12 that attaches to both CS08 cranks. 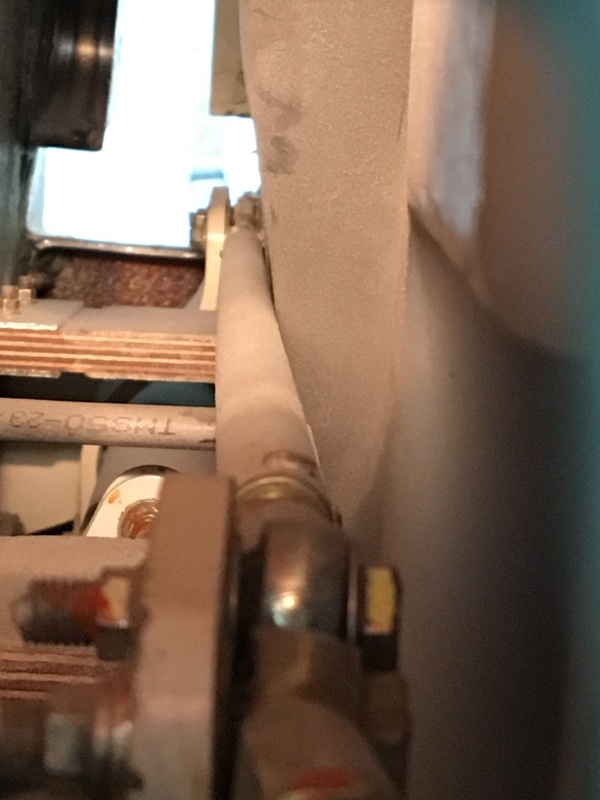 While the pressure is not enough to prevent the control rod to move side to side when commanded, it is of sufficient force to prevent the aileron controls from self centering�..and enough to place a just barely noticeable bend in the Aileron Cross Link Rod. I hope that the server does not strip the three photos I have attached. Can I place an expandable brace against the front wall of the cockpit module and slowly �press� the bulge back to whence it came? Or at least in far enough so as to not interfere with the Cross Link Rod?